TENNYSON, Alfred Lord. The Princess. London: C. Kegan Paul & Co., 1880.
and dated October 23, 1880 (this being copy #41. Bound by Thomas J. Cobden-Sanderson. The great Thomas J. Cobden-Sanderson bound this lavishly gilt apple green morocco masterpiece of art, craft, taste and restrained splendor with his own hands. A key work in the history of bookbinding - this is a superstar binding in all ways - it is being offered for $65,000. Its covers are diapered in gilt with Tudor roses on leafy vines (Cobden--Sanderson Design No. 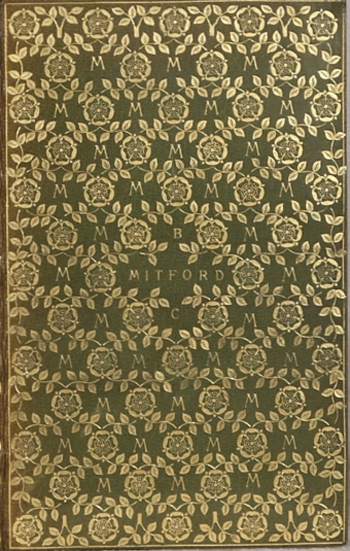 20), each compartment formed by roses containing an "M," the center cruciform panel on the upper cover with the name "MITFORD" tooled in gilt, and a "B" above it and a "C" below it. The rear cover possesses the date "24 February 1886" in the center compartment. Raised bands, a guttered (i.e., concave) spine (as intended), spine panels with central Tudor rose surrounded by leafy vines and much stippling, gilt turn-ins. All edges gilt and gauffered finish the work. The front pastedown endpaper has the engraved bookplate of Bertram Freeman-Mitford. The rear pastedown has Cobden-Sanderson's handwritten receipt for £ 6.6.0 affixed, and the rear free endpaper has manuscript letter from Cobden-Sanderson to Lady Clementine Mitford tipped-in. This is an important, early specimen of the work of Cobden-Sanderson, the central figure in the history of English bookbinding and the father of modern binding. Cobden-Sanderson (1840-1922) did not produce many bindings with his own hands, but he did nothing short of change the entire course of bookbinding in England. Tidcombe's detailed and exhaustive catalogue records just 167 examples of bindings produced by him, all of them executed between July of 1884 and March of 1893. Through this small corpus of work, Cobden-Sanderson "rejuvenated English binding" with his theories of design "and set it on a new course of development" (Adams, Morgan Library Exhibition catalog). Howard M. Nixon calls Cobden-Sanderson a "pre-eminent figure . . . both as a designer of great originality, who rescued the craft from half a century of purely imitative work, and as a craftsman of outstanding ability" (Styles and Designs of Bookbinding From the Twelfth Through Twentieth Centuries. London, 1906). Produced during the first twenty months of his career, the present binding heralds two milestones: the first use of the new Tudor rose and rose leaves (C-S tools 2a, 6a, 6n), and the first employment of an important and improved method of preparing the leather for its gilt decoration). Rear endpaper with Cobden-Sanderson's holograph receipt. Note his stamped-signature in gilt to lower turn-in. Insight into the personal and business side of this volume can be found in Cobden-Sanderson's journal entry for December 22, 1885, which records that "on Saturday [19 December] Mitford and Lady Clementine came and were exceedingly polite. Mitford brought me a large paper (Kegan Paul) 'Princess' to bind by the 24th February, mode and finish to be left entirely to myself." The binder's notes observe that "the design of back-side varies from front. The 'M' is inverted in the lower half [of the back]. This, an accident, [is] a great improvement. Time 54 3/4 hours. Undercharged." From the letter tipped into the volume we further learn that the book was delivered on 23rd February 1886 "by a sure hand," arriving just in time, as it was to be Lady Clementine's gift to her husband on his 49th birthday, the next day. 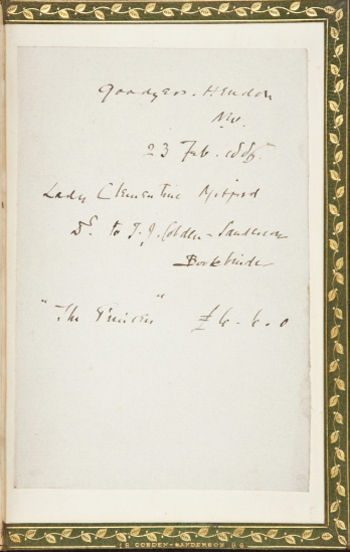 Cobden-Sanderson visited the Mitfords in April and was pleased to find Bertram Mitford thrilled with the binding, even though his "Philistine friends" had thought the (intentionally) concave spine a flaw. Cobden-Sanderson records in his journal on 2 April 1886: "I advised him to stand by the gutter [i.e., defend the spine design], for it was most beautiful." Mitford (1837-1916), the diplomat and author, was created first Baron Redesdale in 1902; he is best remembered as the grandfather of the brilliant and scandalous Mitford sisters, including noted writers Nancy and Jessica, Nazi sympathizers Diana and Unity, and the current dowager duchess of Devonshire. Artist, bookbinder, and fine press publisher, Thomas James Cobden-Sanderson was closely associated with the Arts and Crafts movement. 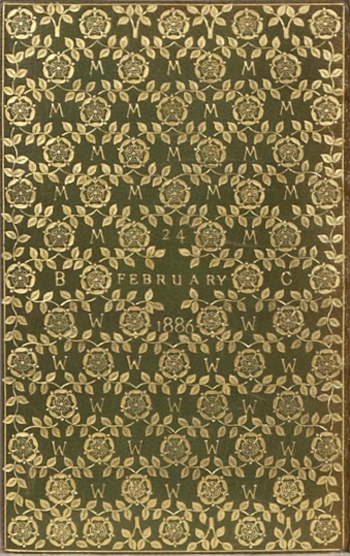 It was during a dinner party held by his friend, William Morris, that the idea of becoming a bookbinder was suggested to him by Morris' wife, Jane Burden. "He told her about how anxious he was to use his hands, and she replied, 'Then why don't you learn bookbinding? That would add art to our little community, and we could work together.' Ten days later he was taking his first lesson in bookbinding from De Coverly, and within a year he was working independently" (op cit, Adams). Opening a shop in 1884, by 1886, the date of this binding, he seems to have hit his stride; the binding, from February, is the first from that key year. In 1900 he founded, in partnership with Emery Walker, the Doves Press (and bindery), located in Hammersmith, London. Born Thomas Sanderson, upon his marriage he added the surname of his wife, Anne Cobden, to his own. "Thomas James Cobden-Sanderson was a small man, intellectual, an unsocial socialist, proud, neurotic, and a genius. His bookbinding and his printing, largely concentrated in the quarter century from 1885 to 1910, have a timeless beauty of style and come close almost to perfection in execution as can be expected from the hand of man. With a minimum stock of binder's tools of his own design…he achieved 'infinite riches in a small room.' He was anti-mechanical, anti-commonplace, and anti-dogmatic with respect to other people's dogmas. John Ruskin was his infallible master, William Morris his fallible mentor" (op cit, Adams). Remember the name Thomas Cobden-Sanderson. Or, as he's known throughout the English-speaking world's Rap community, T-Cob. In Tokyo, T-Cob-San. Marianne Tidcombe's The Bookbindings of T.J. Cobden-Sanderson: A Study of His Work 1884-1893, Based on His TIme Book (London: The British Library, 1984) is the key reference to T.J. Cobden-Sanderson's bindings. Monday: Magnificent Bindings, Bound To Be Great. Unless otherwise indicated, all images courtesy of Phillip J. Pirages Fine Books, currently offering these books through their just published Catalog 61: Historically Significant and Decorative Bindings 1536-2010, a magnificent production, and an instant and important reference source. Thanks for this.....T.J and Roger Payne, 2 genius masters among others I try to emulate with my own work.